Luke and Tiago have been friends since they were in high school together, for over 20 years. Tiago has even known me for 20 years–my family moved into the apartment building across from his family’s townhouse, and I was the little girl running around the neighborhood playing manhunt, while he worked on his motorcycle. Luke and Tiago were not good friends in high school. In fact, when Tiago started attending Father Austin he saw Luke as immature and annoying. Luke saw Tiago as overly confident and condescending. But somehow, through trials of fire and special circumstances, Tiago and Luke became the best of friends. They rubbed off on each other in good ways and in some not so good ways (PURE NONSENSE WAYS–which I have had to deal with over the years). I’ve spent more time with him than any other person on this earth. He knows my deepest secrets and he still loves me. We decided to forgo Larbador. I was looking forward to seeing that part of the province in a car instead of on two wheels because I could take in the view a little more. Also I wanted to share the experience with Cynthia. In the end the conditions were not ideal. It has rained along the most dangerous part of the slick gravel road for days, and would be raining for several days more. This, grouped with so many miles of washboard gravel roads with the trailer and potential breakdown, solidified the decision to go by way of New Brunswick and Nova Scotia. We drove for most of the days leading up to yesterday, and then made our way over on the ferry. Just under $500 got us all passage as well as our rig. With the savings in gas by not doing Labrador, it wasn’t that bad on the wallet. Ottawa had presented a challenge for me. For the first time since leaving home I was overcome with hardship on several fronts. I had encountered a problem with the trailer, I needed to do a much needed repair on the truck hoping it would be covered under warranty, and I felt a sickness coming on. It didn’t seem like much at the time because I was advised by the seller of my trailer that the repair was covered by this affiliate in Ottawa and that the trucks issue may also be covered under the Dodge warranty. So this little scratch in my throat should be a problem either, I thought. I would spend some time with my friends in Ottawa and be out of there in a couple of days. 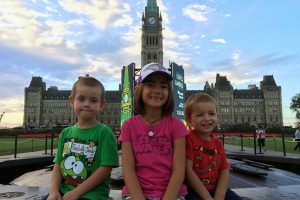 Isla, Jenson and Linc at Parliament Hill. We’re in Ottawa today, and I’m still overwhelmed by the hospitality of friends. Our friend, Aaron, has been gracious enough to invite us to stay at his house while we’re here… Which means normal showers for us and baths for the kids, a real sink to wash dishes and power to run our beloved air conditioner.